Maybe there’s a theme emerging here — behind-the-scenes tweaks while maintaining aesthetic consistency with past generations. Like the new iPhone, the Apple Watch Series 2 is pretty much aesthetically indistinguishable from its predecessor. Heck, even the new AirPods look nearly identical to the company’s EarPods, albeit with their wires snipped off. But while the Series 2 (as the name, perhaps implies) doesn’t feel so much like a full refresh as it does an upgrade, there are some key differentiators here. The biggest, sadly, is one that we weren’t allowed to try out — apparently putting a swimming pool in the middle of the demo room at the Bill Graham Civic Auditorium just didn’t make logistical sense. So much for pulling out all the stops. The waterproofing, which opens the wearable up to swim tracking, among other things, contained a key element that actually elicited an audible gasp from the crowd when the company showed it off: a speaker port that expels water from the device, which is something I really want to try out in person. Here’s hoping we find ourselves around a major body of water when we actually review the thing — I’m told San Francisco has a few. Of course, if you really want to let the world know that you’ve got the new wearable, you can opt for the Nike version. The latest team-up between the two giants is actually pretty good-looking, with brightly colored rubberized bands that have holes punched out, letting the world know that you fully intend to go fast and won’t let something like a fully intact watch band slow you down. However, it’s not the kind of thing you’ll want to wear to a business meeting, unless you work for an energy drink company. There are a few other small differences between the Nike and standard versions, including branded watch faces and shortcuts, but otherwise they’re pretty much the same. That said, the new watch is even more fitness focused than its predecessor. Along with waterproofing comes a new swim app, which offers lap count, distance and calories burned. Also on-board — the biggest addition aside from waterproofing — is GPS. It’s hardly the first wearable to get the functionality, but it should make the device a more compelling buy for runners. Still no cellular connection, however, so users waiting for a fully functional untethered device will have to keep holding their breath (which should also help their swim careers). As with the iPhone, the screen has been brightened, which might not be immediately apparent at first glance. There are also some new cases, including a pretty stunning ceramic one that perfectly matched the snow-white demo room where we got to play around with the device after the event. 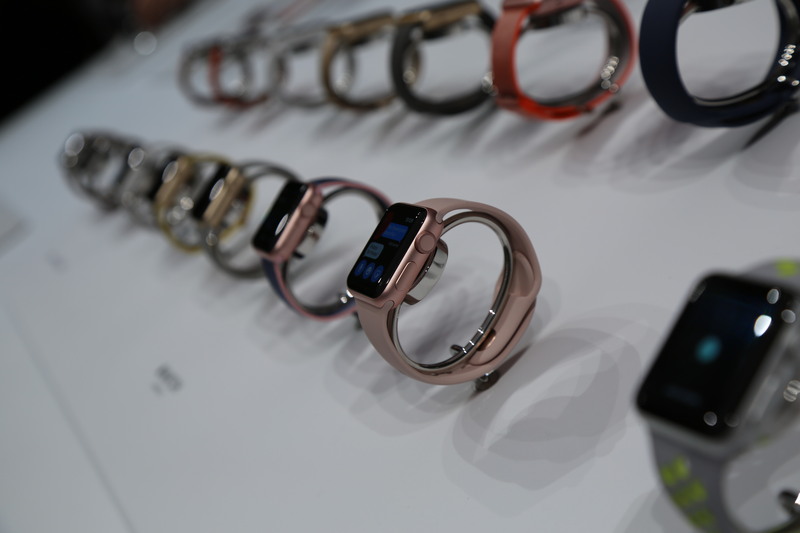 It may well be the best-looking version of the watch Apple has produced to date. The processor has been upgraded, so performance should be improved along with the addition of watchOS 3, which also brings some nice new features like the Breathe app, which plays into the recent trend toward meditation-themed functionality on wearables like the latest Fitbit. 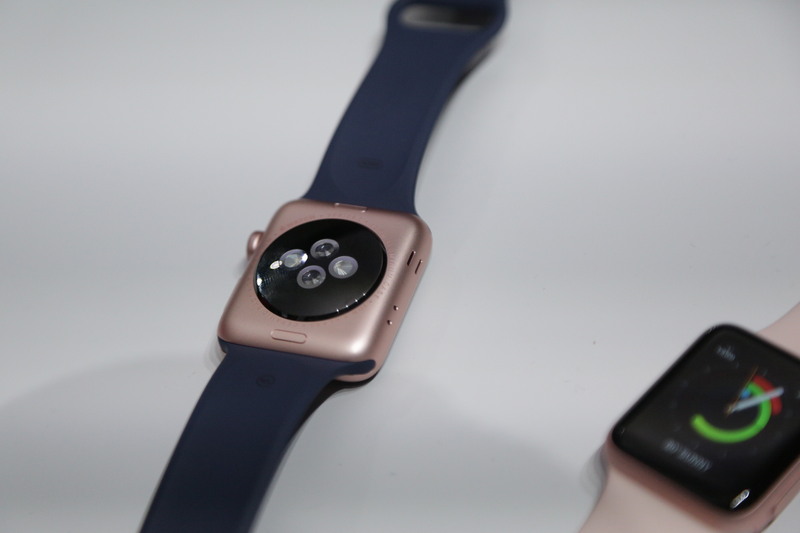 The new watch will run $369 when it arrives September 16. Also, you know, Pokémon.